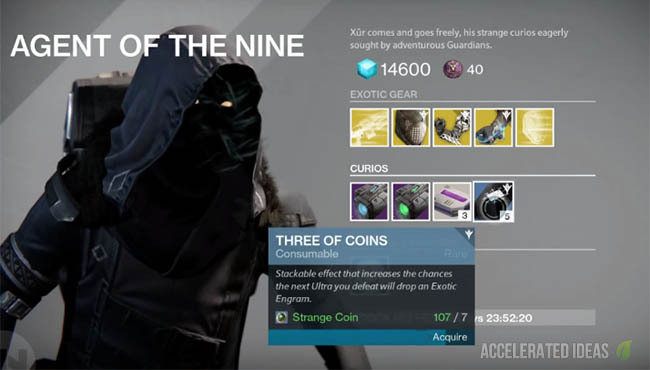 Xur has made his first appearance in the Tower today and besides Warlocks getting the awesome Exotic gauntlets, the Three of Coins purchase is on everyone's mind. These special consumables will increase the chance of the next Ultra dropping an Exotic engram. The Three of Coins is a stackable effect that increases the chance that the next Ultra you defeat will drop an Exotic engram. Bungie also confirmed that if one doesn't drop then the next Ultra automatically has an increased chance. There's alot of speculation on the correct use of the consumable including where to use it, when to use it and most importantly how many to consume. There is a science behind it and understanding how they work will help you spend wisely. The Three of Coins can be consumed anytime before you start an activity. They're not time based like other consumables and only "wear off" after you kill your next Ultra. Players can choose to pop another Three of Coins straight after an unsuccessful Exotic drop because the effect will have worn off immediately. Ultra's are high level bosses in Destiny that display a Skull icon next to their name in addition to a Yellow health bar. If you see an enemy with just a yellow health bar (no skull) then these are Majors and not Ultras. There are far more Majors than Ultras in Destiny and roughly speaking an Ultra is a single BOSS, usually found at the end of a Strike of Story Mission. Some of the other activities also include them such as Court of Oryx (higher tiers only) and Prison of Elders. Although Strikes are convenient, the best activity by far is the Scourge of Winter, a story mission with an easy and farmable Ultra at the end of it. See further down for exploit steps. The question on everyone's mind is "how many should I be using?". There is no perfect answer; only a guess between how many you want to risk vs the increased chance of a drop. 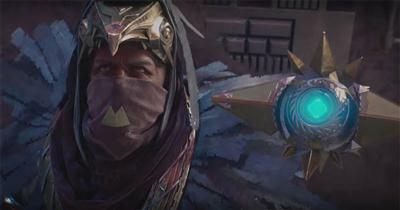 Those with limited time to play Destiny will probably consume many in the hope of guaranteeing an Exotic. It's still early days and there's no evidence that consuming many at once makes that much of a difference. Some players have reported consuming 5 at a time but only being rewarded once in 3 tries. A total of 15 sounds excessive for one exotic. Therefore, hold back on consuming many Three of Coins and instead opt for the guide shown below. If you're looking for the most effective way to exploit the Three of Coins then follow the steps below. As always a big warning here! Bungie will almost certainly fix this farming method at some stage so make the most of it now. Every time you kill yourself and the boss, the Exotic engram will still be lying on the floor from the previous death. If it's not there, immediately pop another Three of Coin and repeat exactly the same process. Every time you're unlucky, the chance of getting lucky next time increases. If you're after alot of engrams then keep cycling through the consumable, boss kill and respawn steps. Make sure you don't survive the boss fight otherwise the checkpoint is lost and the mission has to be restarted. 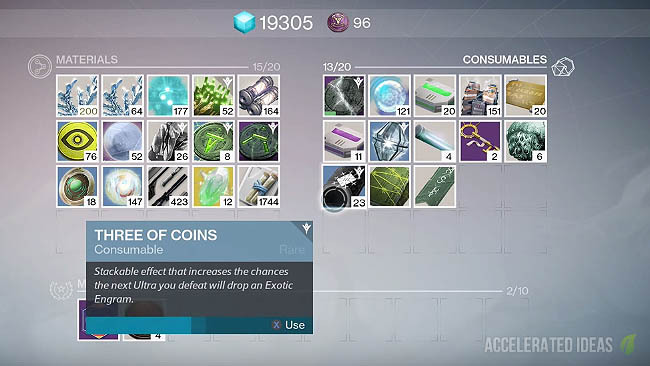 Using this method you should be able to obtain many Exotics with an efficient use of Three of Coins. There will be no wastage since 1 is the minimum required to activate/increase the Exotic drop chance. As expected, Bungie smashed this exploit before Xur could make his second appearance in The Taken King. The result of the nerf is an additional "mechanic" that reduces the chance of exotic drops if Three of Coins are used too quickly. Therefore, the best method for obtaining Exotics now is to run Strikes; as Bungie intended before the exploit was uncovered. You should still consume one Three of Coins at a time and spread them evenly between prolonged strikes e.g. at least 10 mins.